If you 're a food lover like we are, you know that being a foodie is not just about trying new foods and being open to different tastes but it also about being able to learn new tips and tricks in cooking so that you can connect to food right from the comfort of your home and still enjoy something new. So keeping that mind, we decided to make the Chicken and Rice Pineapple Bowls! I am not a cooking expert but I love to try out new recipes and adding something of my own to it at the same time. First, we put our Rice for cooking. I let the water boil a bit and then add a pinch of salt and add rice to it. Make sure the rice is not boiled all the way because we need to add a few other ingredients to it and then we will give it's final rest for a few minutes on low flame. Once the rice are almost fully boiled, drain them and set them aside. We start with our beautiful Pineapple. Cut half from the bottom and half from the top and be gentle to keep the crown intact! Once your pineapple is cut in half, carve it from the inside. You can see how I did it on our Facebook page in the video demo. Save all the pineapple you carved out to make a delicious Pineapple smoothie to go with your Pineapple bowl or maybe for tomorrow's breakfast. Next is turn for our delicious chicken. I have used a boneless chicken breast piece and I cut it into small strips. After that, I added 1tbs of salt, 1/2 tbs black pepper, half a tbs dark soy sauce. Mix it well. Add 2 tbs of Olive Oil in a pan, and cook our chicken in it. I love love love the taste of green chilliest so I chopped 3 green chilies and added it to the chicken. I love sesame seeds and so we are adding 1 tbs of sesame seeds in our chicken. Add 2 tbs of water and put it on low heat for 2-3 minutes. Once done, turn off the heat and set it aside. Now it's turn for our rice. In a pan add 2tbs of Olive Oil, 1 cup of cabbage, chopped bell pepper, green onions and mix them well. After 2 minutes, whisk 2 eggs in a small bowl, add a pinch of salt to it and whisk it one more time. Move the veggies to one side of the bowl as shown in the video and add the whisked eggs. Once you see the eggs have started to cook, break it in small pieces using your spatula and mix the eggs and the veggies at the end. Add this mixture to the Rice and mix it one more time. Lastly, cover the rice pot and put it on the stove on low flame for 10 minutes so that all those flavors can gather up. Now it is time for putting it all together. 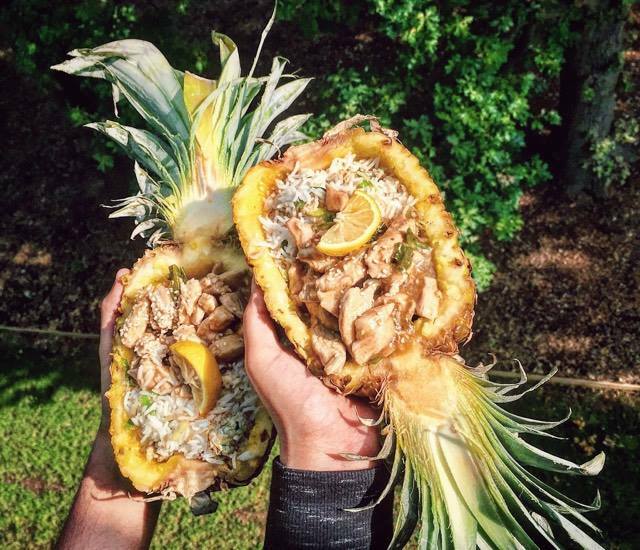 Fill 3/4 of the pineapple with Rice, leaving plenty of space for our chicken. Scoop some chicken in there. Top it off with 1/4 lemon slice and some sesame seeds and you have your delicious Pineapple bowl ready. Enjoy with a mate or with a movie. Let me know if you'd like me to do any other recipes. The entire video of how I cooked the rice and chicken is on Facebook. Don't forget to give us a follow on Instagram and Facebook.